Blue Cheese - Food, Family & Vino! Pulse flour, hazelnuts, and 1/4 teaspoon salt in a food processor until combined. Add butter, and pulse until mixture resembles coarse meal, about 10 seconds. Drizzle 1/4 cup ice water evenly over mixture, and pulse until it just begins to hold together (dough should not be wet or sticky). If dough is too dry, add more water, 1 tablespoon at a time, and pulse. Divide dough in half, and shape each half into a rectangle. Wrap in plastic wrap. Refrigerate until firm, about 1 hour. Let stand for 10 minutes before rolling. Make ahead: Dough can be refrigerated overnight or frozen for up to 3 months. Let chilled dough stand at room temperature for 10 minutes and frozen dough thaw before using. Make the tart: Roll out pastry dough to a 6-by-16-inch rectangle on a lightly floured surface. 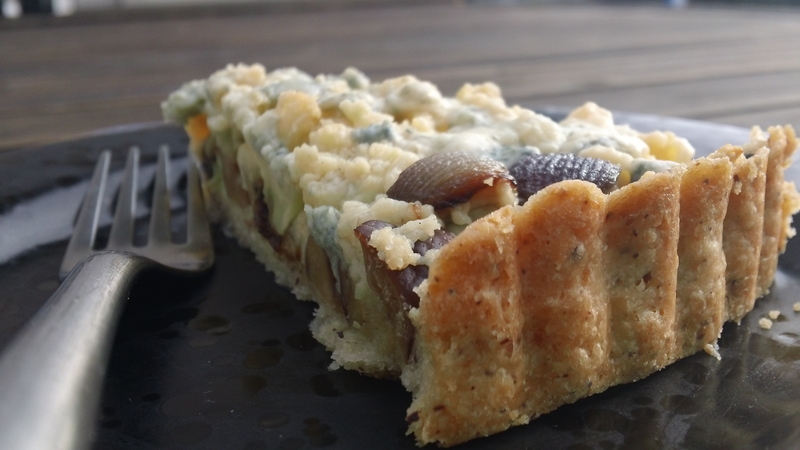 Fit dough into a 4-by-13-inch fluted tart pan with a removable bottom. Trim edges flush with top. Prick bottom of tart all over with a fork. Refrigerate until firm, about 1 hour. Preheat oven to 375 degrees. Line crust with parchment, leaving an overhang on all sides. Fill with pie weights or dried beans. Bake until crust is set and edges are just starting to turn golden brown, about 25 minutes. Remove from oven, and remove pie weights and parchment. Bake until bottom of tart shell is pale gold, about 10 minutes more. Let cool completely on a wire rack. Reduce oven temperature to 350 degrees. Meanwhile, make the filling: Prepare an ice-water bath. Bring a pot of water to a boil. Cook onions for 2 minutes. Transfer to ice-water bath. Drain. Peel onions, and cut each in half. Meanwhile, steam cauliflower in a basket insert set over a pan of simmering water until almost tender, about 3 minutes. Season with salt. Let cool. Heat oil in a small skillet over medium heat. Cook onions, stirring, until browned, about 12 minutes. Make the béchamel: Melt butter in a medium saucepan over medium heat. Add flour, and cook, whisking, for 1 minute. Gradually whisk in milk, and cook, whisking, until mixture is thick and just starts to boil. Add 1/4 cup blue cheese, the thyme, and 1 teaspoon salt, and whisk until cheese melts. Stir in cauliflower, half the onions, and half the chestnuts. 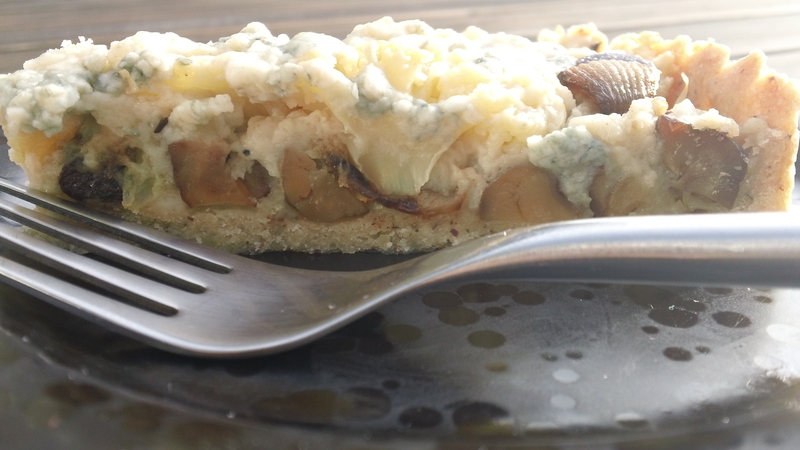 Spread cauliflower mixture onto tart shell. Scatter remaining onions and chestnuts over filling, and dot top with remaining 1/4 cup blue cheese. Bake tart on a baking sheet until filling is bubbling, about 45 minutes. Let cool on a wire rack for 15 minutes before serving.